There's a long-running fashion "standard" that suggests you shouldn't wear white after Labor Day. However, women are wearing white for Election Day, turning up in head-to-toe white outfits at polling stations in November, which is well past the aforementioned Labor Day cutoff. While white is not a super popular fall fashion color, outdated rules like that are falling by the wayside. Another outmoded notion that's crumbling? The idea that only men can be president, that's what! So, why are women and Hillary Clinton supporters dressing in white for Election Day to the point that the #WearAllWhiteToVote hashtag has become a legit thing? Here's the deal. 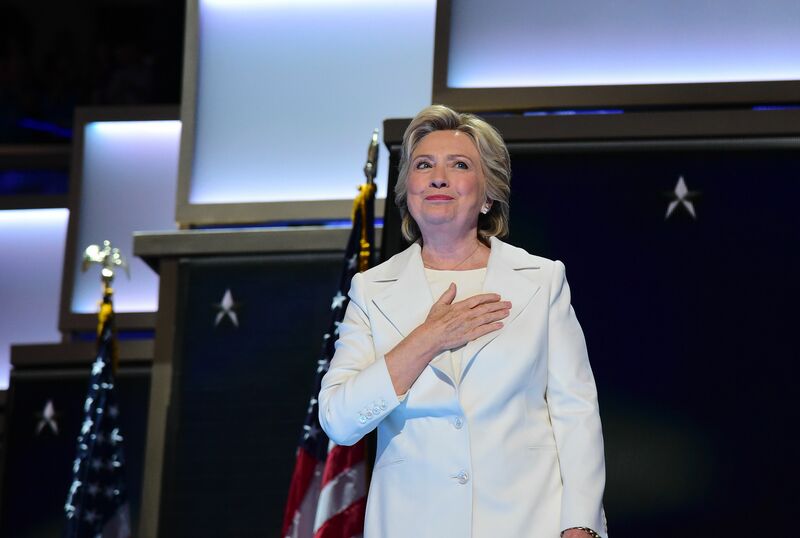 Back in July of 2016, Clinton accepted presidential nomination for the Democratic Party dressed in an impeccably tailored, all-white Ralph Lauren suit. The New York Times suggested that Clinton's choice of an all-white ensemble was an act of paying homage to the suffragist movement. It was Clinton's quiet but high-impact way of acknowledging history, since the official colors of the National Woman's Party and suffragist movement, which fought for women to have the right to vote, were white, purple, and gold. Clinton's subtle but important act of wearing white is trickling down, as her supporters are showing their solidarity by voting while decked out in white. It's another way to display support for both Clinton and the women's movement. This effort proves that fashion can be functional and can make multiple, important statements beyond demonstrating your personal style. As a more recent The New York Times article noted, Clinton's pantsuits have become part of the national, political, and pop culture conversation. But it's her white pantsuit that has opened even more doors of awareness and pointed to the feminist current running through her campaign. Perhaps one of her supporters has become more keenly aware of the suffrage movement and of further women's issues, both past and present, because of it! That's a beautiful thing. This sums up all of the feels.